A chaotic event in Ceres highlighted problems with the social grant system. By Barbara Maregele for GROUNDUP. 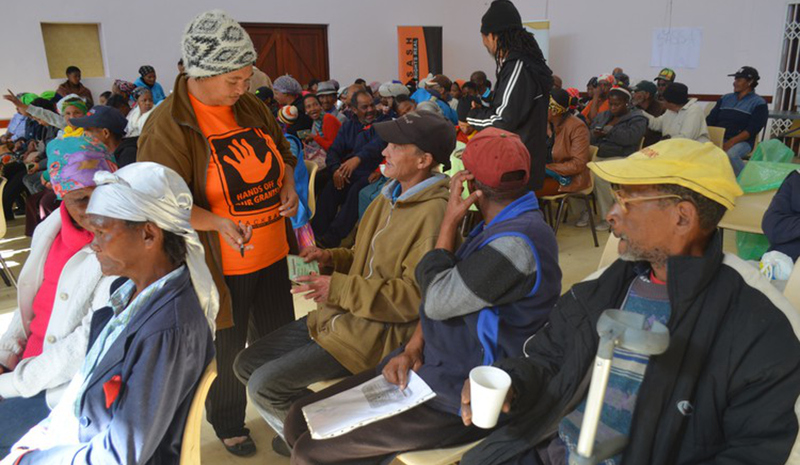 On 5 June, nearly 500 mostly old-age grant beneficiaries from Ceres, Tulbagh, Op die Berg and surrounding areas, filled the Bella Vista community hall in Ceres. David Polkinghorne, managing director of Grindrod Bank, and representatives from Net1 and the South African Social Security Agency (Sassa), had set up workstations “to deal with beneficiary queries”. By the end of the meeting, over 200 EasyPay Everywhere (EPE or “green” card) accounts were closed by their holders. On 7 June, Net1 – parent company to Cash Paymaster Services (CPS), which pays South Africa’s social grants – accused the Black Sash of “enticing” grant beneficiaries into attending the Ceres meeting. The company alleged that beneficiaries with queries about unauthorised deductions and funeral policies on their accounts were told they would be refunded once they closed their EPE accounts. The Black Sash has responded that grant recipients attended the event “out of their own accord”. The Ceres event came after a community meeting on 18 May, hosted by the Black Sash and the Witzenberg Rural Development Centre (WRDC), where a number of people complained about inexplicable deductions for airtime and electricity, and for multiple funeral policies being made on their “green cards”. These cardholders wanted to return to the Sassa card. Many people complained that in order to query deductions, they either had to borrow money to call the helpline or to travel to the nearest Net1 office in Worcester, 45 km away. Green cards are issued by Net1 subsidiary company EasyPay Everywhere to social grant recipients who apply for loans. The card is used by grant recipients to transact on their accounts. At the 18 May meeting, the Black Sash gave a memorandum to representatives from Allan Gray, one of Net1’s major shareholders, calling for: monthly statements to card holders, and for these to be free of charge; that beneficiaries should not be given an EPE account with SmartLife policies, if they do not qualify for loans; if beneficiaries wish to close their EPE accounts, it should be done within 30 days in the town it was opened; that Net1 should stop selling Smartlife policies as a condition to get a loan; and for Allan Gray to ensure that Net1 officials went to Ceres to personally assist those who wished to close their accounts. The Smart Life Insurance Company: Offers life cover to grant recipients. There are a bunch of other Net1 subsidiaries involved in the social grants system, but the above are the most well-known. Grindrod Bank, while not owned by Net1, has a close relationship with the company, and many grant recipients have their money paid directly into a Grindrod account. Two weeks later, representatives from Net1 and Grindrod Bank were in Ceres to deal with the complaints. When GroundUp arrived on 5 June, about 200 beneficiaries were already seated inside the Bella Vista hall with a bus full of people still waiting at the gate. The team from Net1 and Sassa had already set up small tables with five biometric machines. At the start of the event, Black Sash director Lynette Maart read out the list of demands given to Allan Gray and asked how many beneficiaries in the hall had green cards? Nearly everyone put up their hand. Maart then asked how many wanted to close their EPE accounts. About half of them raised their hands. Anja Lewington, operations manager at Net1, told the meeting that each table would deal with different queries. Lewington also said accounts could not be closed immediately there. She asked those who wanted to close their accounts to leave their details and the company would call to “verify the beneficiary and confirm the closure of the account” later that day. This is when things became somewhat chaotic. Beneficiaries quickly moved to queue at the different tables. The queues were long and snaked along the sides of the hall. Many elderly people, some on crutches, also stood in line. A group of people had also gathered outside the hall where a Net1 official was taking details. Some grant recipients told GroundUp they were angry because once they reached the front of the line, they were told to join another line to get bank statements before they could be helped. By 2pm, more people had arrived at the hall; many people had been there since 10am. The Black Sash and the Witzenberg Rural Development Centre began serving people soup and bread. “It’s important for (Net1) management to realise that if you want to be in this business, you’ve got to put the infrastructure and customer relations in place. You can’t just open accounts, make money from it and not provide a full service,” said Van Vrede. Outside the hall, Net1 spokesperson Bridget von Holdt told GroundUp that the event was a “disaster”. “People are going to realise too late that if someone dies tonight, they don’t have cover, and that if their policy or deduction is not paid up and they have cancelled the (green) cards, they are going to be in trouble,” she said. GroundUp sent a number of questions to Net1. The company responded with several claims which GroundUp in turn put to the Black Sash and the Witzenberg Rural Development Centre. Black Sash and Witzenberg, however, said a Net1 official on the day of the event gave them the names of 372 grant beneficiaries who wanted to close their EPE accounts. “Throughout the day, we maintained an intimidation-free environment. If Net1 estimates that 246 people left the hall without closing their accounts, it directly contradicts their accusation that the Black Sash and WRDC were forcing people to do so,” the organisations said in a joint response. Net1’s Von Holdt said 149 people wanted to close their Net1 issued Smart Life policies. “We arranged for Smart Life officials to process such cancellations through biometric verification and an explanation of the termination,” she said. Contradicting the testimony by beneficiaries that they were told Smart Life insurance was a prerequisite to getting a loan from Net1, Von Holdt said that Net1 loans were not subject to any life cover agreement. “We found that cardholders had previously entered into loan agreements with other micro-lending service providers, where life cover was a prerequisite for the loan being granted. Net1’s loan product offering and our insurance product offering are sold completely independently. Clients did not understand that the premium for the Smart Life funeral cover would continue after their loan had been repaid,” she said. Von Holdt said that no issues or disputes were raised in respect of Moneyline loans. “We also received 42 sworn affidavits to terminate policies from service providers including 1Life, Assupol, Emerald Life, Prosperity etc. We will forward copies of the affidavits to the respective service providers and SASSA for urgent resolution. Nine people wanted their profiles blocked for prepaid airtime and electricity,” Von Holdt said. In response, the organisations said that in February, grant recipients from Ceres, Prince-Alfred-Hamlet and Op die Berg alerted the WRDC and Black Sash that Moneyline/Net1 consultants would not allow them to apply for a loan without taking a Smartlife funeral policy and opening an EPE bank account. “We challenge Grindrod Bank to provide figures for EPE cardholders, who have a MoneyLine loan, with a SmartLife policy,” the organisations said. The organisations responded that they had paid for buses for grant beneficiaries living within two hours from the Ceres venue and provided them with sandwiches. The Black Sash said that for many beneficiaries, the event served as the only opportunity for most people to talk directly to Grindrod Bank and Net1 officials as their closest office is in Worcester. “Consultants drive to towns and farms to sell these financial products and then disappear. To get recourse, grant beneficiaries then have to foot the bill for transport and telephone costs from their meagre grant monies. The amount of people who came showed how difficult it is to contact Grindrod/Net1,” the organisations said. Von Holdt also said that the legalities around the Ceres meeting “leaves a lot to be desired”. She said that it was a requirement that people providing advice to card holders be trained, accredited and registered. “The Black Sash certainly took the lead in providing financial advice to card holders. Net1 will therefore seek advice from the Financial Services Board before participating in meetings of this nature in the future,” she said. The organisations said that the aim of the event was to bring an “EPE branch” to beneficiaries. “Grindrod has a very small footprint.